Are you looking to break into UX design? This resume shows you how to build a powerful brand by showcasing education, externships and technical skills. Are you looking to break into UX design? To be a successful candidate for tech jobs, resume expert Kim Isaacs says it helps to have a comprehensive resume. View the resume sample for an entry-level user-experience designer that Isaacs created below to see how you can build a powerful brand by showcasing education, externships and technical skills. 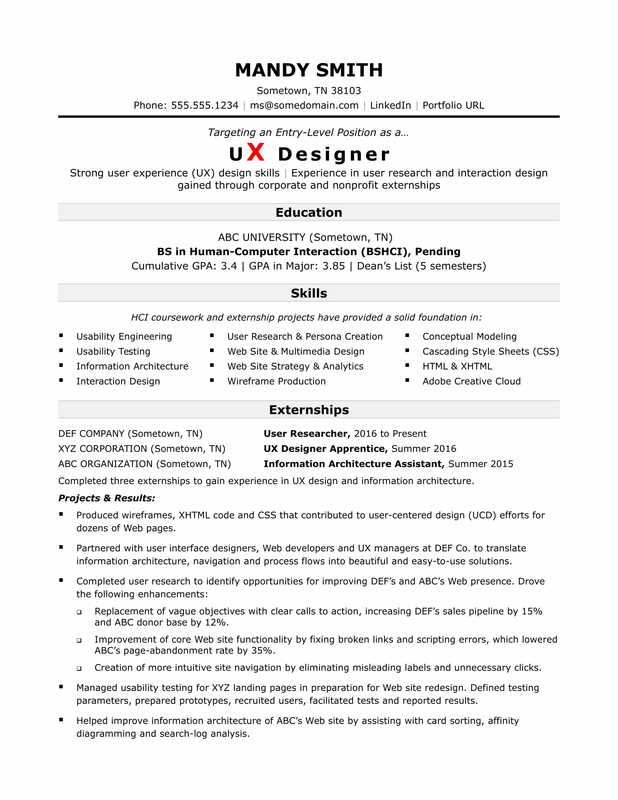 You can also download the entry-level UX designer resume template in Word. And if you need more help, get a free resume evaluation from the experts at Monster's Resume Writing Service. Produced wireframes, XHTML code and CSS that contributed to user-centered design (UCD) efforts for dozens of Web pages. Partnered with user interface designers, Web developers and UX managers at DEF Co. to translate information architecture, navigation and process flows into beautiful and easy-to-use solutions. Replacement of vague objectives with clear calls to action, increasing XYZ sales pipeline by 15% and ABC donor base by 12%. Improvement of core Web site functionality by fixing broken links and scripting errors, which lowered XYZ’s page-abandonment rate by 35%. Creation of more intuitive site navigation by eliminating misleading labels and unnecessary clicks. Managed usability testing for XYZ landing pages in preparation for Web site redesign. Defined testing parameters, prepared prototypes, recruited users, facilitated tests and reported results. Helped improve information architecture of ABC’s Web site by assisting with card sorting, affinity diagramming and search log analysis.